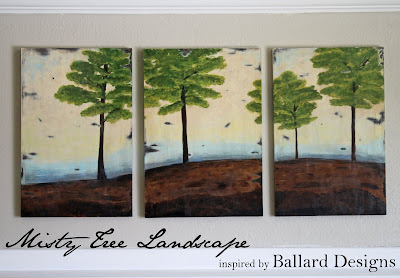 A while back, Jessica at Running with Scissors posted a fun triptych landscape painting she made for her mantle. and decided I'd have a go. Since we moved into our current home, I had altered decor enough I was ready for a change. I did paint quite a bit in high school, like I mentioned HERE...but it's been a long time since I tried anything like this. I purchased a two-pack of canvases on sale, and painted over my old bathroom "art". I started with a coat of black acrylic craft paint. It completely changed the vibe in our bathroom. I love how it came together. I actually found my old oil paints and brushes at my mom's house a few weeks ago and brought them home. Maybe when the busy summer is over, I might try some more painting. Wow.... incredible! You did a fantastic job... I love them! I'm really impressed! You could totally sell those paintings and I'm completely sure you'd fins lots of people interested in them. They're fantastic! Chris, I think they are beautiful. I am so impressed. It makes me want to try something and honestly I have never tried painting. I don't think it would go as well. You are so talented in so many different areas. this little triptych is so great Chris. I'm really impressed by your freedom with the brush. wow! well done! These are really beautiful, I love the sanding through to the black affect, very nice. Nice job! They are lovely! 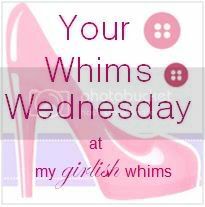 Be sure to come grab your featured button and link up more great projects to my weekly link party. you did a nice job! I think paintings are a wonderful addition to a home and your creations are very pretty indeed! this is SO beautiful! you are so so talented. i wish i could paint like that! the end result is fabulous, and you sure saved a lot of money not getting those ballard originals!! oh wow. yours is my favorite of all three versions. I always wanted to copy a ballard painting. They look great! they look awesome, I love the orientation of the group on your all...I think I like yours better than mine! Good tip with the glazing medium, I'lll have to try that next time. Thanks for letting me know about that one! Wow! You are a talented painter! It turned out great and now I'm feeling like I need to change up the bathroom too! And I can't believe you painted right over the old art! I would've never thought... learn something new everyday! Somehow this post didn't appear in my reader. This is absolutely amazing!! I love how you persevered. You definitely have a gift in the fine arts. Love this. I kid you not, I thought yours was the professional inspiration! I love it even more than the Ballard ones! Every time I see these paintings in Ballard I think of recreating it too...So funny how certain paintings speak to all of us. 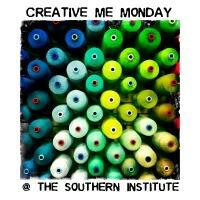 Would love if you popped over some time. Those are beautiful. I like them better than the Ballard ones. What a sense of accomplishment you will have every time you look at them. @Tracie OBThank you! I currently have them in our rental's family room, and they brighten the room up. I appreciate your kind words.